Yes, Brussels sprouts are Paleo! Those Tiny Stinky Cabbage-Looking are the Bomb! Brussels sprout is a member of the Brassica oleracea including cabbages, cauliflower, collard greens, kale and broccoli. They look like mini cabbages as they come from the same family. Brussels sprout has been popular in Brussels, Belgium, where it originally got its name. They are buds that grow along the length of a thick, fibrous stalk. Brussels sprouts have been underestimated by many and so you will seldom hear from people that they love eating it. The 2008 survey conducted by Heinz showed that it is the most hated vegetable in America. 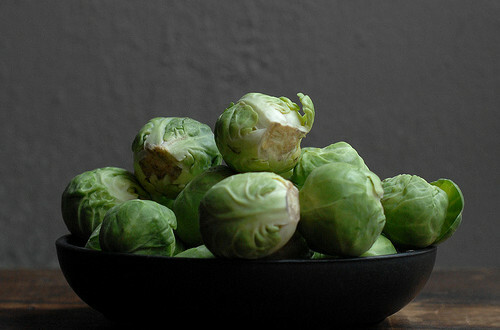 The main reason people hate Brussels sprout is because of its smell and strong flavor. They actually stink when overcooked and boiled. The pungent smell is associated with glucosinolate sinigrin, an organic compound that contains sulfur: hence the odor. Though Brussels sprout have an unappetizing odor and strong flavor, it comes with many health benefits. Raw Brussels sprouts contain nutrients: high levels of vitamins C, K, moderate amounts of Vitamin B, thiamine, riboflavin, magnesium and fiber. Like broccoli and other members of the brassica family, it is a good source of sulforaphane, a phytochemical that has potential anti cancer properties. The stinky sulfur content of Brussels sprouts aid in digestion and detoxification process. Many of the liver’s enzymes can only be made with it. Brussels sprouts can provide cholesterol-lowering benefits through its fiber components. When the fiber binds together with the bile acids in the digestive tract, the bile acids will be easily excreted from the body, resulting to lower levels of cholesterol. Glucosinates, an important phytochemical known to be cancer-protective are higher in Brussels sprouts compared to other cruciferous vegetables. The anti-inflammatory nature of glucosinates can reduce the risk of Crohn’s disease, insulin resistance, obesity, diabetes and ulcerative colitis. But Aren’t Brussels sprout Goitrogenic?? Goitrogens are naturally occurring chemicals that can interfere with the thyroid functions causing goiter. Brussels sprout are known to be goitrogenic as with other cruciferous vegetables because they contain goitrogens. But it doesn’t necessarily mean that they are harmful when consumed. For healthy people, consuming Brussels sprout will not interfere with the thyroid function. But for people who have their thyroids compromised, they can still be eaten only in limited amounts after steaming. Steaming can eliminate the goitrogenic compounds of Brussels sprouts. Does Anticoagulant Ring a Bell? Anticoagulants are naturally-occurring substances that work to prevent blood clotting. Brussels sprout is a good source of Vitamin K or potassium, a blood clotting factor. Therefore, Brussels sprout is not recommended to be eaten in excess especially for heart patients or people taking anticoagulants as this will counter the intended effects of the blood thinning drug. Steaming is the healthiest and most recommended cooking method in the Paleo diet. For Brussels sprouts, not only will steaming remove the goitrogenic compounds, but it will keep most of its nutrition and flavor. Roasting Brussels sprout can improve its taste and will preserve the antioxidants and water soluble vitamins it contains such as Vitamin C and glucosinates. Do not overcook Brussels sprout to avoid releasing the pungent smell and strong flavor. What Experts Say About Brussels sprouts.. Is It Paleo? The Paleo Diet. Oven Roasted Brussels Sprouts. Chris Kresser. Got digestive problems? Take it easy on the veggies.